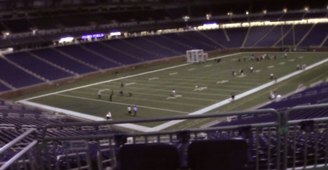 Last week I got to run around Ford Field on day one of Go Further – an event which shows the direction Ford motor company is taking. We got to Ford Field and had cocktails and hors d’oeuvre. Then, we sat and heard from Bill Ford. He talked about the direction of Ford Motor company and how they are re-inventing themselves. Then, we went down to the field to get a first hand look at how Ford is helping local economy thrive. They set up kicking stations, where we could learn how to kick a field goal. Some people were passing around the football, while others were talking and learning about this field. We were on the practice turf. They change the grass to the game-day field, and another grass for other events. Before Ford Field, the land was a six-story Hudson’s warehouse. Ford built the field around the warehouse, trying to keep a look and feel of the business. The stadium truely has end-zones in the east and west sides (as opposed to north and south, or north-west and south-east). NFL has a rule against it to keep the sun out of players eyes. The following is the Ford event. Enjoy! We get to hear from Scott Monty, a host of other bloggers including friend Mike Perlman, and of course, I try to kick a football.